MARTIN, Tenn. — The Tennessee Association for Community Leadership honored the University of Tennessee at Martin’s WestStar Leadership Program with the 2018 Outstanding Leadership Program Award during its annual conference held Oct. 17-19 in Knoxville. This is the first year WestStar has received this honor. The WestStar Leadership Program, established in 1989, is the oldest and largest regional leadership program in the state and currently boasts more than 800 alumni. The 2019 class, chosen in December, will be the 30th in program history. Each year, approximately 30 new WestStar class members participate in sessions across West Tennessee to discuss the challenges and successes of the region and develop new ideas to improve the economic prosperity of the area. The WestStar Leadership Program also hosts the Working Women’s Conference each February and the first and only regional African-American Leadership Conference each April. The FutureStar and RisingStar regional programs for youth also provide leadership development for students in grades seven, eight, 11 and 12, respectively. “Through my involvement as a participant, alumnus and board member, I have seen the value of this program and the benefit it has to rural West Tennessee,” wrote Jake Bynum, mayor of Weakley County, when recommending the program for this award. “WestStar not only teaches invaluable leadership skills and information about our communities, but it also provides a network of connections that I have been able to use time and time again.” Bynum is a 2013 WestStar graduate. For more information on the WestStar Leadership Program or the Tennessee Association for Community Leadership, contact Virginia Grimes, WestStar program coordinator, at 731-881-7298 or vgrimes@utm.edu. 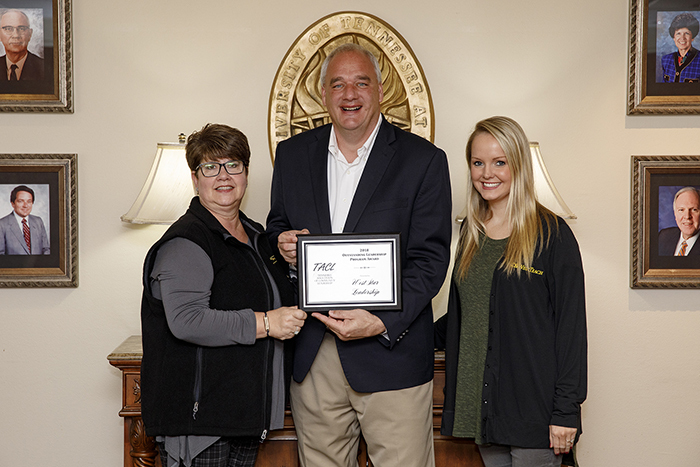 PHOTO ID: (l-r) Virginia Grimes, WestStar coordinator; Dr. Charley Deal, executive director; and Jordan Jones, administrative assistant, are pictured after receiving the program’s Outstanding Leadership Program Award.